Kilimanjaro is the tallest and the most famous mountain in the continent of motherland  Africa. Mount Kilimanjaro is in the north of Tanzania, located in the Kilimanjaro National Park. Kilimanjaro is a dormant volcano which has three separate volcanic cones, Mawenzi, Shira and Kibo, where the Uhuru summit is located. Hikers journey through five differing ecosystems – from alpine desert to rainforest right up to the arctic snowcap. Climbing 19,340 feet up is undoubtedly an empowering adventure of note. Approximately 35,000 people launch to climb each year. The number of people that actually reach the top of the summit remains an elusive statistic. The “Kili” climbs can take between five and nine days, depending on the route you choose and the time you have for the mission and reach the altitude. 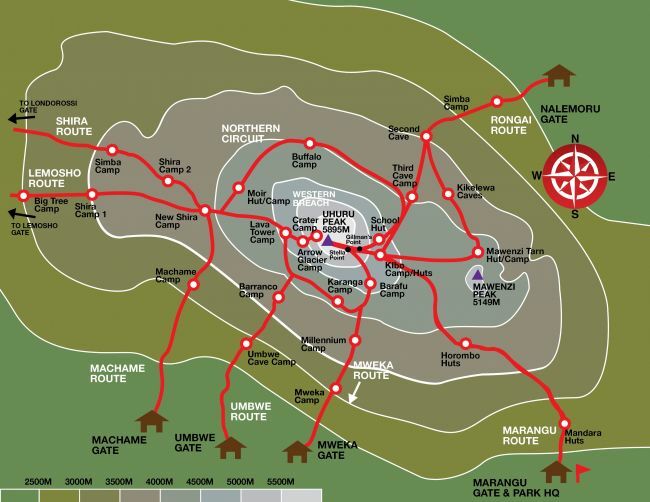 There is a total of  Kilimanjaro routes. Three routes from the south including, Machame, Marangu and Umbwe , two routes from the west – Lemosho and Shira, from the  North-East Rongai. Another option is the Northern Circuit approaching from the with Lemosho as the starting point, and circles around the north  following a summit passage through Gilman’s Point. The first successful Kilimanjaro expedition took place 125 years ago. In October 1889, mountain climbers on a mission to reach the peak conquered the Mount Kilimanjaro after forty years of previous attempts. Mount Kilimanjaro is the highest mountain in Africa, the most iconic peak in the world. Snow capped and close to the equator, Mount Kilimanjaro attracts climbers from all over the globe. Reaching Africa’s highest point is a challenge many seek to undertake. Why? It is Africa’s highest mountain and the world’s highest freestanding mountain. Open plains rise up to touch soaring clouds with snow capped peaks at an elevation of 5895m. Every ecological system existing in the world can be found on the mountain from tropical crops to cultivated slopes, lush forests n wild animals. Cactus like plantations, giant lobelia lies in above the forest. A saddle stretches between the Mawezi and Kobo peaks. Cactus like plantations, giant lobelia lies in above the forest. A saddle stretches between the Mawezi and Kobo peaks. The roof of Africa is a wonderland of magnificent beauty. Kilimanjaro is an accessible summit. The Kobo peak can be reached without any special mountaineering equipment or climbing experience. A determination with proper clothing is all that is needed. The climb takes about six days with about five overnight stays in tents or mountain huts. Gillman’s point is the lower peak on Kobo and Uhuru peak is the highest point. Spectacular glacier views and a wide crater.It is unforgettable triumph point expedition. Main tips to take note off. Tourists need to register and climb with a licensed guide. Altitude sickness can affect the fittest. The clearest night sky and willowy grass and the second peak loom ominously and untouched as it is an impossible climb. There is much more along the way to Uhuru. It is about pushing yourself to the limits to gorgeous views from Uhuru, the summit of the Kibo peak. The entire climb takes you into another world. Planning to travel to Africa and venture on mountain climbing? Let’s start at the beginning of creation, the heart of the motherland, Tanzania. Many nature lovers, come out to explore amazing wildlife and exciting Safaris. Others that have little interest in game drives and Safaris opt for climbing and hiking adventures. It becomes a combo of a Safari and a mountain climbing venture as the lush pathways have many wildlife sightings as well. usually aim for Mount Kilimanjaro. Mount Kilimanjaro is number one on the list. It is the most famous and the highest mountain on the continent of motherland Africa. Other mountain ranges that have attractive peaks are in the North and East of Tanzania. We have Mt Meru, Ol Donyo Lengai active volcano, and the tamer Usambara Mountains, gentle Crater Highlands slopes. First on the list is Mount Kilimanjaro. In the northern Tanzania plateau with snowy peaks, above the rolling hills.The glaciers and slopes reaching way above the clouds. Mt Meru Crater is neglected if favor of his East neighbor Mt Kilimanjaro. This mountain close to Arusha National Park is definitely an experience that will be an unforgettable memory. The low slopes are covered in a highlight of a dense forest where buffalos graze and the colobus monkeys play. This extinct volcano has a base of a perfect crater and an additional inner crater with sheer, sharp cliffs. The subsidiary peak is formed by the Ash Cone. Momela lakes and Ngurdoto Crater are visible from the mountain slopes. The Crater Highlands rise up from the Rift Valley.The lush chain of volcanoes and mountains including the Ngorogongo conservation area that is surrounded by Massai tribal lands. Hiking Safaris offer tourists a pathway from Ngorongoro Crater to the foot of Ol Donyo Lengai and a chance to see stunning scenery of spectacular Tanzania. Hiking Safaris offer tourists a pathway from Ngorongoro Crater to the foot of Ol Donyo Lengai and a chance to see stunning scenery of spectacular Tanzania. This is a hiking adventure of a lifetime. Large zebra and wildebeest herds graze nearby and lions lay back in the sun. At the calling of dawn, the black rhino return and to the thick layer of crater forests after completing their dew-laden grass in early morning mists. Nearby Massai herd goats and cattle over the green pastures of highland slopes. At the calling of dawn, the black rhino return and to the thick layer of crater forests after completing their dew-laden grass in early morning mists. Nearby Massai herd goats and cattle over the green pastures of highland slopes. Stretching all the way from the Taita Hills South of Kenya to the Southern Highlands of Tanzania the Eastern Arc mountain range has a long history of geological activity. It is estimated to be over a hundred million years old and some formations are six hundred million years old. The climate stability allows this area to inhabit a wide array of insect and plant life to amazing species of birds. A low altitude range of mountains that on the border of Lake Nyasa.It is in a remote location and difficult to reach as the pathways are uncharted for the climb and are usually unexplored. A few hours away from Arusha, a day trip to the Monduli Mountains can either be a journey of a casual day trip or part of a hiking itinerary that is longer. Massai herd cattle along the slopes and various cultural tour programs offer visitors an opportunity to learn about traditional medicines and local culture of the Massai. It is surrounded by views of the rift valley, Mount Meru, and Mount Kilimanjaro. Located on bumpy tracks about 200km on the South East of Arusha, the extinct volcanic crater is a stunning feature above the plains.It is usually a two-day climb, that takes trekkers via several tribal lands including the semi-nomadic Barabaig, known for goatskin garments. Overlooking The Kenya bushland and Lake Natron, Ol Donyo Lengai meaning ‘ the home of God’ in Massai, this is an active volcano and an undiscovered and spectacular climb in Tanzania. It has sporadic volcano eruptions, sending gray lava streams down the rim of the crater and spits out hot ash into the air. The climb is usually overnight for hikers to experience the spectacular sunrise over the escarpment of the Rift Valley. On The Eastern Arc range in the North East of Tanzania lies the remote Pare Mountains and is extremely rewarding to trekkers on a search for trails off beaten paths. It is home to the Pare tribe, pastoralists, and agriculturists who have retained traditional life.A Pare mountain hike takes visitors through beautiful forests and local villages, part of Tanzania that is little visited. The Udzungwa Mountains is located on the west of Dar es Salaam.It rises from the West of Selous Game Reserve. Vervet monkeys play in the forests and forest antelopes can be viewed at certain times of the day. The botanical diversity is exceptional, and the park hosts numerous endangered species of birds. The peak of the mountain offers views of the Selous game reserve and the coast of the Indian Ocean. It is a worthwhile venture. The Uluguru mountains overlook the Morogoro agricultural area and part of the Eastern Arc range. Named after the Luguru tribe, a group that farms on the verdant slopes.This area is amidst the oldest forests in Africa.Hiking here is pleasant and rewarding.It has a plethora of endemic insect and bird species. Part of the Eastern Arc in the North East and is divided by 4km valley of farms and small villages. There are day trips and overnight treks, taking visitors through an area of concentrated biodiversity. Bird watching is rewarding and the views include the Indian Ocean and Massai Steppe.